Edit: Scroll to the bottom for updated pictures on the wear as of September 2017! I first heard about Allbirds, a company that makes merino wool sneakers, from Clara Parkes' Knitter's Review. I immediately bought a pair, I was that intrigued. I consider myself a reformed sneakerhead. I've pared my collection down significantly because really, who needs a pair of knee-high purple animal print Converse All-Stars? Deep down, however, I want ALL THE SNEAKERS. First of all: I love the packaging. Bad packaging isn't a dealbreaker to me but really excellent packaging enhances the experience and influences my feelings about a product. This is how my sneakers arrived, minus two of those plastic zippy things strapped around it that I cut through. That box directly holds the shoes, none of this 'shoebox shipped inside another, bigger box' crap. I chose the Dark Kea Green color in my usual size 7. 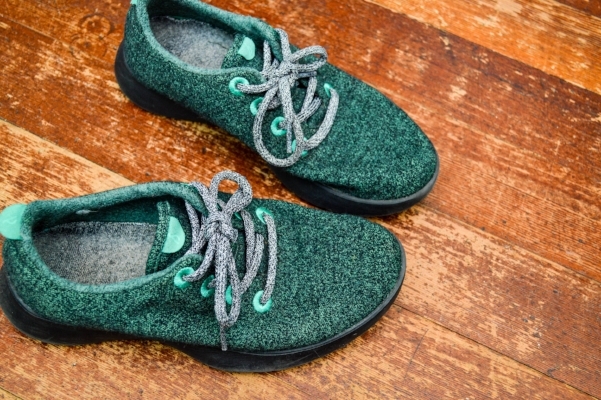 Interestingly enough, the eyelets and small details on the tongue and heel are shown in black on the Allbirds website but mine are a lighter teal color. I much prefer this pop of color so I'm happy with the switcheroo, though it's a little strange! The color range is...odd. For women there's this color, a gray, a light blue and an orange-red. You'd expect me to gravitate towards the orange, but it's a completely monochrome shoe and I don't dig that look. Sole, laces, everything is the same color! I was hoping the Dark Kea Green would be neutral enough to go with everything while being a little more exciting than gray. Luckily I was right. I've worn them all day yesterday and today, so these are my first impressions. I tried them once briefly with socks but otherwise, I've been wearing sans socks as Allbirds suggests. I will admit that I smelled my shoes yesterday after wearing them all day at work and they don't smell like feet. We'll see how long that lasts! I'm a bit dubious of their odor reduction claim. They are extremely lightweight and I feel like I'm not wearing any kind of shoe. It feels very minimal and not at all invasive. However, this could be a drawback when walking on rough terrain. I do feel every little texture change and bump through the soles. My feet feel cozy, not sweaty. I wonder if your feet tend to run hot if they would feel uncomfortably warm? There is some arch support but not a lot? To be honest I don't really pay attention to this, though I should since my feet pronate. I wore Converse, Vans, and other support-less shoes exclusively for years so arch support is not something I instinctively notice. I would not wear these running or doing any kind of high impact activity. I suspect the wool upper will attract dust bunnies and cat hair. I've brushed a few fuzzballs off the toes already. Guess I need to start sweeping more regularly! ...they're $95. Not terrible in the world of shoes, but at the moment these are an unknown and I don't know how they will hold up in the long-term. 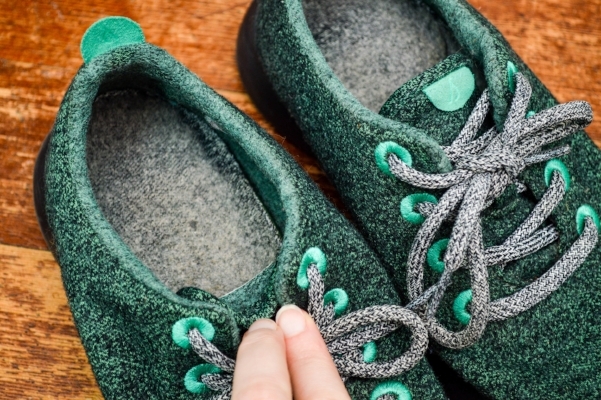 Allbirds has a generous return policy that helps take the edge off that uncertainty. You have 30 days to test the sneakers out and can return them even if you've worn them outside. I'm reserving full judgement until I've spent more time in them but so far, very happy with my purchase! If you have the petty cash and want to try something unique I highly recommend picking up a pair and telling me what you think. It's been fun making my coworkers guess what shoes are made of! You can see in the photo above that the shoe has stretched/sagged a little from accommodating my foot (specifically on the inside of the top shoe--my feet are pronated, aka they roll inwards, so this is normal for me). This is only visible when unworn, it's not like there are pools of fabric sagging around my toes when worn! I haven't ever removed the insoles for washing and these are the original insoles, no need for a replacement yet. Here's what the wear to the soles looks like. I do scuff/drag my feet sometimes when I walk. Overall, I am very happy with my Allbirds purchase and these are my only pair of everyday/casual sneakers. I have separate shoes for working out, and I don't wear these in heavy rain.